high protein breakfast recipes. 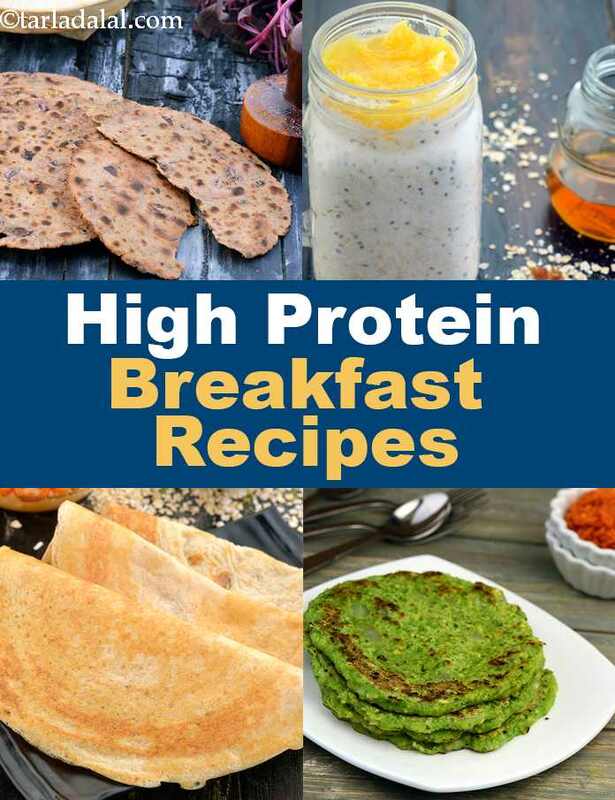 protein rich Veg Indian breakfast recipes. It’s a known fact that breakfast is the most important meal of the day. There are many benefits to eating breakfast within 2 hours of waking up. It energizes you and helps you focus with concentration at work or school. It kick starts your metabolism and helps you burn calories throughout the day. Thus it is considered as a weight watchers friend. If One-fourth of your daily protein requirement comes from breakfast, you are set to keep your body cells healthy. If you wish to begin your day with porridge, turn to Jowar and Vegetable Porridge, or even Muesli with Nuts is sure to make up for your protein needs. On the other hand this sections includes assorted steamed breakfasts like Green Peas Dhokla and Nutritious Stuffed Idlis. If you are looking for a heavy protein packed breakfast, especially when you are not sure of your next meal, try your hand on Mini Green Theplas, Hariyali Tofu Roti etc. While on days you are on go, do not miss out to whip up a protein shake like Date and Apple Shake. For lacto-ovo vegans, we have also included a few recipes like Egg Bhurji, Fried Eggs and Preworkout Smoothie for Runners. Our section on high protein breakfast recipes includes a variety of dosa recipes. Since dosas are prepared using a combination of cereals and dals, it makes it a good quality protein containing recipe. Oats must be consumed daily for its high content of soluble fibre ‘beta-glucan’, a potent blood sugar and cholesterol-lowering agent. Healthy Oats Dosa is made without any rice. It is made with fibre-rich oats and is good for diabetics. It is gluten-free and a good source of protein. The dosa requires no soaking – you just need to blend and ferment, so it is relatively easier. The Healthy Oats Dosa tastes as good as regular dosas, especially when served with the trademark chutney and sambhar team! Oats Mutter Dosa is an instant dosa recipe packed with protein and fibre. The addition of urad dal and carrots make the dosas rich in protein and vitamin A too. Rather than using high glycemic index rice, this 4 Flour Dosa is made with fibre-rich flours like whole wheat, bajra, jowar and nachni. Since the batter is fermented, it becomes easier to digest, and also gives a nice texture that is both crispy and fluffy. This is a wise choice for diabetics, but we recommend having it with a small portion of sambhar only, to avoid excess fat from coconut chutney. Oatmeal Almond Milk with Oranges is a meal-in-a-jar that is unbelievably easy to make but exceptionally nutritious too! Dates and honey give it a natural sweetness while oranges make it mildly tangy. Healthy and low in carbohydrates, this tasty Black Raspberry Smoothie can be had for breakfast or as a snack any time during the day. Black raspberry is low in calories, bursting with antioxidants power, and rich in a type of flavonoid called anthocyanins. Saffron Cardamom Almond Milk is loaded with protein and high calcium, this is an excellent option for vegetarians, vegans, lactose-intolerant folks, and those on an exercise regime. Enjoy the deeply Indian touch of this recipe! Avocado Spinach Vegan Smoothie is a nutrient loaded recipe where avocado helps to thicken the smoothie and gives it a lovely creamy texture. It also happens to be a super food of sorts. It is rich in vitamins, antioxidants and protein, but is still easy to digest.